‘Splinter Cell Conviction’ Review — Sam Fisher Claims his Revenge! Splinter Cell: Conviction on the X360 and the PC evoked mixed reactions from reviewers and consumers alike as it departed from the traditional stealth-centric Sam Fisher formula and opted for a more aggressive, guns-blazing approach. 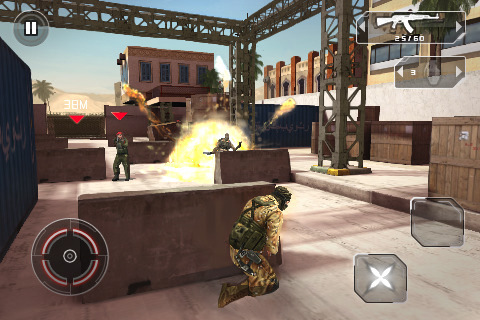 Gameloft‘s portable adaptation follows in the same vein, but also seems to introduce some of its own issues. From the onset it is clear that Splinter Cell Conviction is one of the better looking games on the App Store. This can be attributed predominantly to its terrific looking and varied level themes, from grand historical Maltese buildings to dock-side marketplaces and even a trip to the middle east, Splinter Cell: Conviction does a great job keeping the eyes engaged. The storyline on the other hand is fairly disengaging; cycling through the usual cliches and predictable plot-turns as Sam seeks revenge for his daughter’s murder. As with most 3rd person games on the App Store, Splinter Cell Conviction is controlled with a virtual analogue stick and on-screen buttons. These buttons are context-sensitive, the action button changing between firing your weapon at range and grappling enemies when up close. Though the context-sensitive controls should work well, we felt that they haven’t been executed as well as they could have. The stick-to-cover button doubles as the multi-kill button, but often when the multi-kill option is present, Sam will instead opt to stick to cover (despite that button not even being visible at the time it was pressed). In fact, we found the cover system to be unresponsive in general, often impeded our control of Sam. Only designated objects can be used as cover (despite some looking blatantly like they are there solely for cover), and when in cover, even the slightest movement of the analogue stick can cause Sam to jump out in the open. A similarly arbitrary feel permeates the shooting system in Splinter Cell Conviction, arguably the largest aspect of the revised not-so-stealthy gameplay. Rather than being able to shoot at whatever is under your cross-hair, it appears that Sam can only engage in enemies when the crosshair turns red. On many occasions, this is despite the enemy being in plain sight and well within range. 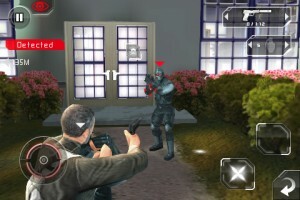 In other situations, Sam can headshot an enemy at great range with a pistol– when the red crosshair permits of course. The AI is another problematic area, but not to the degree that some readers have suggested in our forums. Enemies will sometimes run at Sam without restraint, gratuitously falling to his bullets, and at any difficulty level below the hardest, will take a very, very long time to take Sam down. Enemies seem to be a more than a little light sensitive too, often ignoring Sam despite him standing on their toes, so long as he remains out of the light. Despite this, enemies flow thick and fast and provide enough of an obstacle to keep the pace up and Sam constantly engaged. As do the levels themselves, as though they are predominantly about taking cover and dispatching enemies, they are varied in both theme and substance too. Some levels force Sam to engage with the few gadgets at his disposal, such as peeking under doors or throwing camera grenades to get an edge over his enemies (though usually these are not at all required to actually complete a level). Another level has Sam aboard a speed-boat, a graciously on-rails sequence that lets you deviate from the ordinary pace of the game and mow down approaching enemies with a chain-gun. It’s good fun that helps break up the 11 available levels. Ultimately though, we think Splinter Cell Conviction’s biggest problem is how successfully it recreates that Splinter Cell feel. If the game didn’t look and sound so great, then its obvious mechanical and AI hitches wouldn’t seem so glaring in contrast. While we may be holding the game to somewhat higher console-like standards as a result, that feeling is something that was inescapable and interfered with our overall enjoyment of the game. 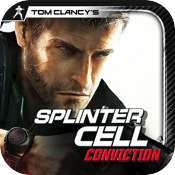 App Store Link: Splinter Cell Conviction, $9.99. Previous PostPrevious ‘Denki Blocks!’ Review – The Modern Day, Mind-Bending Tetris!